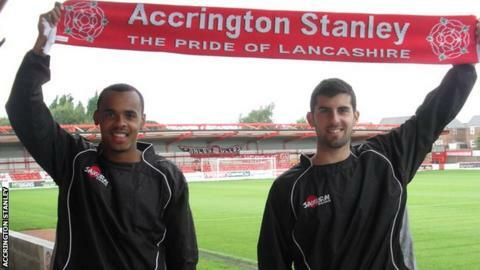 Accrington Stanley have completed the loan signings of Watford duo Matthew Whichelow and Piero Mingoia. Whicelow, 20, is a winger who has made five starts for the Hornets and joins on a three-month loan deal. Midfielder Mingoia, also 20, has joined on an initial one-month loan but the deal could be extended. "Neither of us have come here to just watch, we want to play games. If that means battling for positions then so be it," said Whichelow. "I've heard about other players coming here on loan and doing well like Tom Lees at Leeds. "He came here and did well and now he's just got an England call-up. We'd like to come in and do exactly the same." Whichelow has been on loan at Exeter and Wycombe, whilst Mingoia has had stints at Brentford and Hayes & Yeading. "We must thank our chairman Peter Marsden and Watford. Peter's got great connections down there and we're trying to build up a little link," said Stanley boss Paul Cook. "We do try to build up links with clubs higher than us to maybe use a player or two of theirs for development and we're very grateful to Watford for giving us the two boys." Both players go straight into the Stanley squad for the game against Chesterfield on Tuesday.